Introductions - Norah Gaynor (King County Parks), Jack MacKinnon (Marymoor Community Gardeners Association), Michael Hobbs (Eastside Audubon, FOMP Secretary), Barbara Dickson (neighbor), Herb Bone (MAR/C), Christina Merten (Marymoor Community Gardeners Association). Pet Garden – One gate installed. More pending archeological survey. Artifact discoveries may impact gate installation. Barriers and gates may need to be attached to existing structures instead of using new posts. 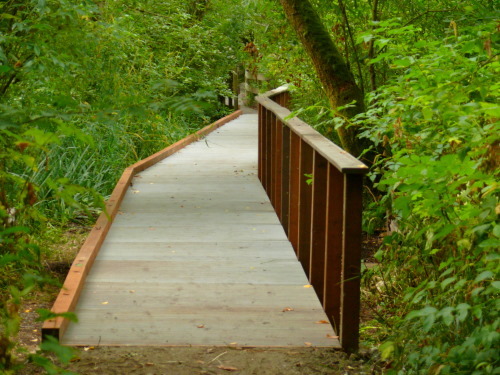 Birdloop – Boardwalk extension complete! Eastside Audubon will be leading several habitat clean-up and enhancement projects during the Day of Caring on September 11, working with volunteers from Microsoft. Some projects will be along Snag Row, others in the East Meadow. Maintenance & Art Barn Roof Replacement – Work scheduled for September (delayed from July). Staging will be on the west lawn of the maintenance barn. A recycled plastic fake "Cedar Shake" product will be used. Norah passed a sample around and it looked very good. NE Marymoor Way - Road overlay work to be done. Line painting still to be finished. Community Garden – Kiosk project continuing as noted last month. New water connection via fields 7,8,9 to increase pressure at Wash Spot and garden during heavy watering season. Will be installed this fall. At one point, an emergency switch to non-potable water was considered. Christina expressed some frustrations about the communication at that time. In discussion, it appears that changes on the MCGA side will help. Electrical Work - Some solar parking fee stations are being converted to electric (less maintenance, more reliable and faster service). Lights are being added to fee stations in areas of scheduled evening use (esp. near athletic fields near the tennis courts and velodrome). Security light to be installed at turf soccer complex entrance. Work is in progress - Lot B machines have been upgraded. Currently waiting on light poles. Garden Loosestrife Control Project - Some spraying along the slough this week. Fish and Wildlife Foundation turned down the grant request for 2010 - said our project does not match their conservation priorities at this time. Frana will look into it and let us know if further action is necessary. As you might recall, a few months back, KC Parks applied to Nat’l Fish and Wildlife Foundation’s Pulling Together Initiative for a grant to support our efforts to control garden loosestrife in Marymoor Park. Unfortunately, we were not invited to submit a full proposal and continue in the process. L Disappointing news. I’m still trying to get a hold of the NFWF folks to learn more about why we weren’t invited to submit a full proposal, and in the meantime Marymoor staff are going to continue the control effort in-house. We’re still hoping to develop a base of community/volunteer support through Eastside Audubon, Friends of Marymoor, etc, so I hope you’ll remain engaged on some level with what’s happening. I’m guessing that Marymoor staff will work through Friends of Marymoor’s monthly meetings to keep everyone posted about the project’s progress, and feel free to contact Norah Gaynor or Karl Kostal at Marymoor Park with questions about the loosestrife control efforts. Let me know if you have any questions about the grant, and thanks again for your interest and support of our application! Picnic Shelters - The same roofing product as with the Maintenance & Art Barn roofs will be used on the two picnic shelters along the road to Lot D.
Norah relayed to Herb that the contract between MAR/C and KC Parks has been updated in draft fashion to incorporate comments from MAR/C. It is moving onward through Legal. Wednesday September 23, 2009 7:00 – 9:00pm. Marymoor Art Barn.